concert with Hair (Born Bad) and Team Ghost (Disque Primeur) + dJ's and Nicolas Hellvice Malinowski (ill-studio). 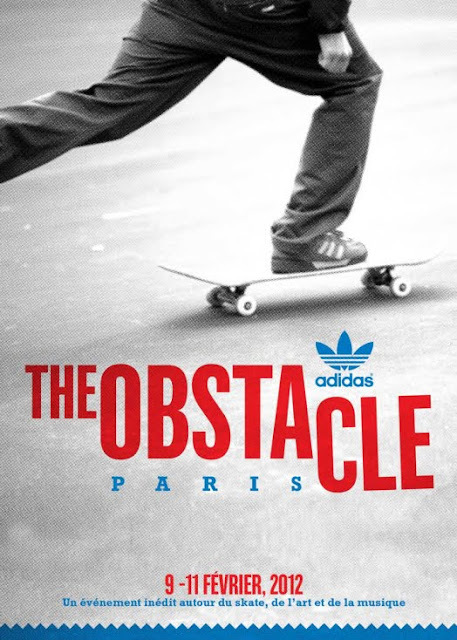 Adidas France is working with le centquate (104) and leasing part of their space to develop The Obstacle, a cultural event focused around skateboarding, art, and music. The event is free and open to the public. Vistors are encouraged to take advantage of the exhibition, concerts, skate school for children, demonstrations of professional skaters, and an invitational competition. The Obstacle engages vistors in various activities creating a postive experience. Rich Holland has been involved in the London skateboard scene for years, especially as a partner in the Cide skateshop and a founding member of The Side Effects of Urethane (TSEOU). Dedicated to exploration of the creative and visual connections of skateboarding, TSEOU is a dynamic collective of artists, graphic and product designers, photographers, architects, film-makers, writers and journalists working and living in London. As part of an ongoing series of exhibitions, Badger’s skateable sculpture has found homes in museums, forgotten lanes and most famously under the Royal Festival Hall, known to most as Southbank, in London. Currently, Rich lives and works just south of the artic circle at Floda31, his own design research centre that allows him to expand his horizons and breathe fresher air. Mark Gonzales Mark Gonzales is considered one of the founding fathers of street skating and is largely responsible for what we have grown accustomed to in every corner of every city around the world: the act of adapting tricks to your surroundings. Gonz’ spontaneous approach is not limited to the act of skateboarding. Mark has always added his scribbles, poems, paintings, murals, marker drawings and stunts to all aspects of his professional skateboarding career and as the head of Krooked skateboards.